In computer science, the longest common substring problem is to find the longest string that is a substring of two or more strings. 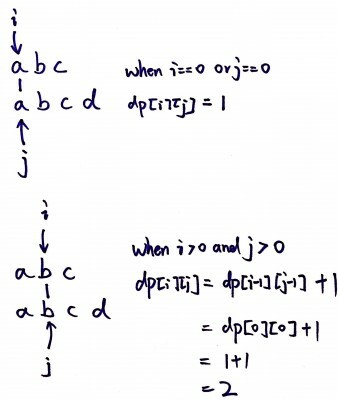 Given two strings a and b, let dp[i][j] be the length of the common substring ending at a[i] and b[j]. 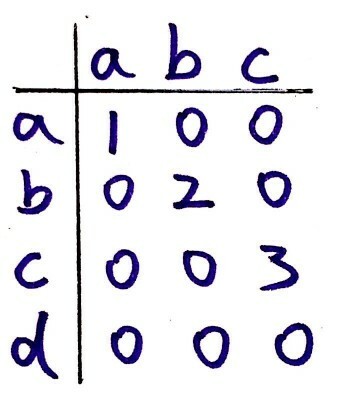 The dp table looks like the following given a="abc" and b="abcd". This is a similar problem like longest common subsequence. The difference of the solution is that for this problem when a[i]!=b[j], dp[i][j] are all zeros by default. However, in the longest common subsequence problem, dp[i][j] values are carried from the previous values, i.e., dp[i-1][j] and dp[i][j-1].